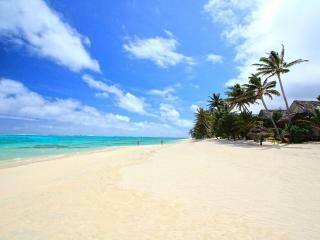 If you are after an affordable, quiet, beachfront Cook Island holiday then Castaway Resort is an ideal choice. This property is an adult's only boutique resort that features a swimming pool, direct beach access, restaurant and bar. The accommodation is self catering, giving you the option of cooking for yourself! Castaway Resort is set on the edge of the lagoon on the western side of Rarotonga Island allowing for some of the best sunsets in the Cook Islands. Club Raro Resort is located just 5 minutes from the main township of Avarua and is set amongst beautiful winding mosaic pathways, swaying palms and tropical gardens, creating a warm, friendly and relaxing atmosphere. Sip a refreshing cocktail next to the swimming pool, enjoy a bite to eat at the alfresco dining area which boasts magnificent views of the sparkling lagoon, snorkel or scuba dive with the colourful marine life or take time out with a relaxing massage. 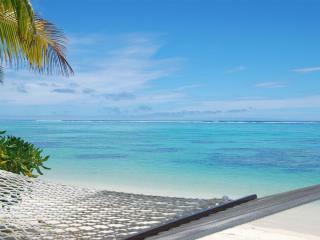 This Cook Islands accommodation is the ideal location of couples after a honeymoon destination or romantic getaway. Crown Beach Resort & Spa Resort is located on a stunning white sandy beach in Rarotonga and boasts amazing sunsets over the ocean. Imagine lazing by the pool or on the beach with cocktail in hand while soaking up the sun. Lagoon Breeze Villas Rarotonga is located a mere 10 minute drive from the International Airport and 5 minutes from shopping. The property is accross the road from the beautiful beaches of Rartonga and offers villa style accommodation perfect for families and groups after self catering facilities. Sitting right on the edge of the Titikaveka marine sanctuary is Little Polynesian Resort, a beautiful island getaway with a traditional touch. Combining modern conveniences and Polynesian design, this Cook Islands accommodation is an adult only resort; the ideal destination for your next romantic escape. Spend your days lazing on your daybed overlooking the beach and lagoon while the staff cater to your every need. 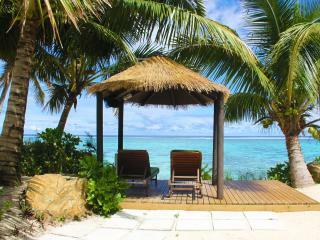 Magic Reef Bungalows is located on the western side of Rarotonga in the Cook Islands. This boutique accommodation features 9 Bungalows to choose from, all with different beach views. All Bungalows have self-catering facilities perfect for families or couples wanting the option to dine in. 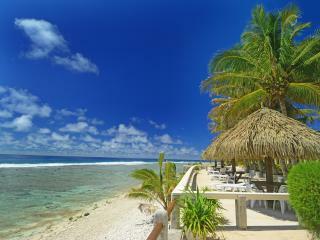 Manuia Beach Resort has an absolute beachfront location on Rarotonga's sheltered, sunset coast. Just 10 minutes from the airport, 5 minutes from the golf course and 15 minutes drive to Avarua, the main township. With magical sunsets over a sparkling blue lagoon and a sheltered white sand beach, the Manuia Beach Resort offers discerning guests a tranquil and romantic getaway with great amenities and service. Enjoying a prime location on shores of a long white sand beach, Moana Sands Beachfront Hotel & Villas features a range of rooms all with stunning ocean views. 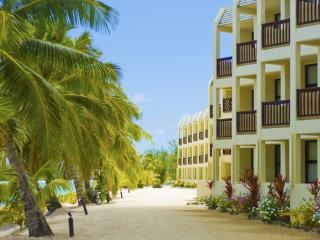 With the sand literally at your doorstep, Moana Sands Beachfront Hotel offers a friendly relaxing atmosphere. The hotel beach is located on the southern coast a premier location for swimming and snorkelling. 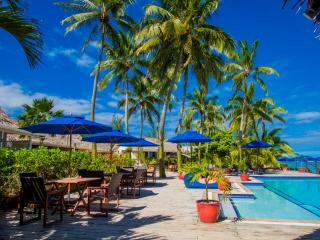 Muri Beach Club Hotel enjoys an enviable location on the very best stretch of beach on Muri Lagoon. This adults only getaway retreat offers privacy and relaxation in a beautiful setting. The rooms at Muri Beach Club Hotel are chic, modern and comfortable with most rooms featuring stunning views. This Cook Island hotel is perfect for weddings, couples and honeymooners. 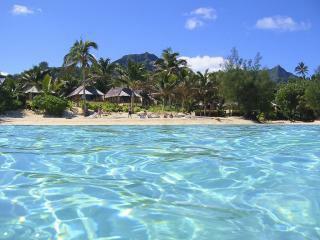 Muri Beachcomber lies on the southeast side of Rarotonga and sits along the shores of the beautiful Muri Lagoon. All accommodation at Muri Beachcomber is self contained, and features well equipped kitchens, outdoor areas and individual barbecues. Guest facilities includes a freshwater swimming pool, easy access to Muri Beach and free use of snorkelling equipment. Exclusively located on the edge of Rarotonga's finest lagoon, the Pacific Resort offers a variety of accommodation options including studio, one and two bedroom units and villas, all air conditioned and fan cooled, with garden or beachfront settings with self catering facilities. The Barefoot Bar and Sandals Restaurant are popular local night-spots, offering weekly entertainment and theme nights. Tropical luxury with barefoot elegance. Your private piece of paradise delightfully set in the enchanting region of Vaima. Thirteen well appointed garden bungalows set amongst hibiscus and tipani flowers are complimented with 13 beautiful beachfront bungalows on an exclusive white sand beach. New restaurant and bar on site. An easy, laid-back atmosphere prevails at this truly idyllic little property. Boasts an amazing beach just steps away from this Cook Island accommodation and offers a small number of rooms' that ideal for couples, small groups and families. 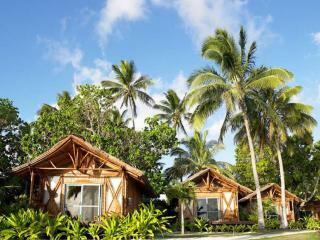 Puaikura Reef Lodges features rooms with full kitchen facilities that are spacious and comfortable. Spend time relaxing by the swimming pool or enjoying the sun on the white sandy beach. The Rarotonga Beach Bungalows is an intimate property offering five spacious one bedroom bungalows with excellent access to a wide ocean washed, white sand beach on the Southern coast of Rarotonga. All bungalows have a separate bedroom, kitchenette and a wide covered deck. Snorkelling equipment is complimentary and the lagoon has great snorkelling with many species of colourful marine life. Royale Takitumu Villas is the ideal destination for your next romantic island getaway! Offering private and self-contained beachfront villas Royale Takitumu Villas is Cook Islands accommodation at its finest. Relax in a hammock on the white sandy beach overlooking the clear blue waters of the lagoon, and then have your own personal Chef create an intimate dining experience on the veranda of your Villa. Catering for guests 12 years and over, Royale Takitumu Villas will ensure your Cook Islands retreat is perfect in every way. Rumours Luxury Villas & Spa offers absolute beachfront. The villas are total luxury in every respect including a private pool to each villa. 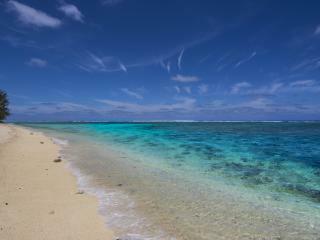 This Cook Islands accommodation welcomes guests aged 15 years and older, making it the ideal honeymoon or couples haven. 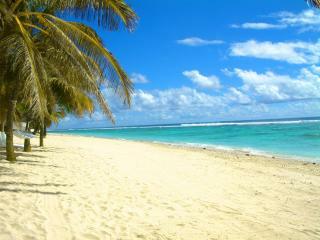 Sanctuary Rarotonga on the Beach is an adults only resort - perfect for a relaxing island holiday or romantic getaway! With an absolute beachfront location, you can spend your days snorkelling, swimming or kayaking in the crystal clear blue waters of Aroa Lagoon Marine Reserve or relax by the pool and enjoy a cocktail from the swim up pool bar. Resort facilities include a pool and swim up pool bar, day spa, restaurants and bars and full access to all facilities and services of The Rarotongan Beach Resort & Lagoonarium, located next door! 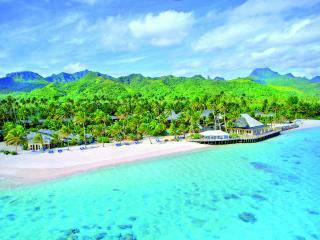 Sea Change Villas is a small luxury resort located on the Titikaveka lagoon in Rarotonga, Cook Islands. With only 12 villas, Sea Change Villas ensures an absolutely private and intimate experience. All villas offer views to the azure blue lagoon, are fully self-contained and are appointed in modern and luxurious detail. If you are looking for that perfect romantic getaway, Sea Change Villas is your next Cook Islands destination. 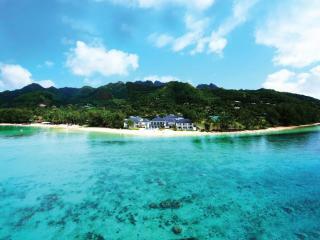 Sokala Villas offers luxurious waterfront accommodation on the corner of Rarotonga's glorious Muri Beach. The resort welcomes adults only and offers a great relaxing holiday where you will be sure to enjoy deluxe facilities with peace and tranquillity. Sunset Resort offers a beachfront location just minutes from the airport, golf course and local town of Avarua. The rooms and suites offer kitchen facilities so are perfect for those who enjoy self catering. This Cook Island accommodation is exclusively for those over 12 years of age so you can be assured your time at Sunset Resort will be peaceful. You can spend time at the resort swimming pools, by the bar or in a hammock as the sun goes down over the ocean. Te Manava Luxury Villas & Spa features 5 star self-contained Cook Islands accommodation at its best. With villas and their surrounds oozing with luxury and stunning beauty guests are assured of the ultimate island retreat where they can choose to do as little or as much as they please. 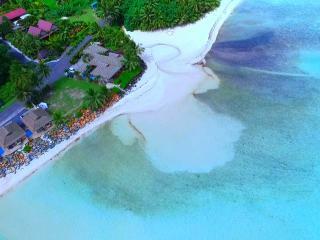 Te Vakaroa Villas sits along the stunning Muri Beach in Rarotonga. For luxury Cook Islands accommodation you can't go past this boutique six villa resort. Privacy and tranquillity are assured as you relax on the daybed on the balcony or laze by the infinity pool. Choose to self-cater in your fully equipped kitchen or take a short stroll to local cafes and restaurants offering the best of the Cook Islands in true island style. 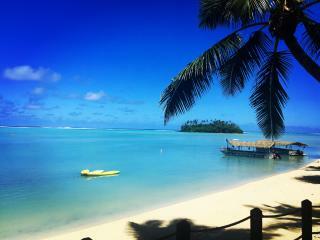 Set amongst tropical gardens right on the waters edge, The Edgewater Resort & Spa is Rarotonga's largest resort! Fully air conditioned rooms, numerous facilities including a spa and salon, tennis courts and a freshwater pool will make your next Cook Island holiday one to remember. The Spaghetti House and Brasserie are onsite, and sumptuous Island Night feasts and cultural shows come highly recommended. At The Rarotongan Beach Resort & Lagoonarium you step out of your Beachfront Room directly onto Aroa Beach, one of Rarotonga's most beautiful white sandy beaches and into the brilliant blue lagoon for spectacular snorkelling. The Resort offers SpaPolynesia - a tropical spa and beauty therapy centre, two restaurants, bar, nightly dinner shows including the spectacular 'Legends of Polynesia', Wedding / honeymoon packages, complimentary daily activities programme, Moko's Kids Club, tour desk, two gift shops, plus a range of air-conditioned Rooms and Suites featuring all modern amenities.